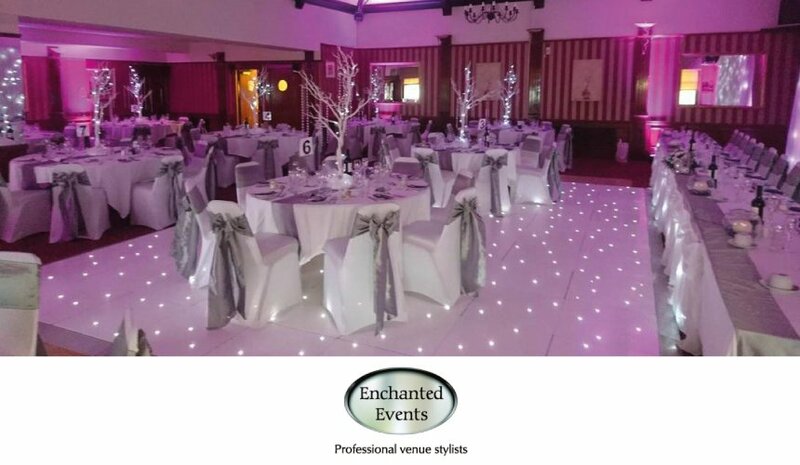 Get your venue dressing from Enchanted Events at The Wedding Event Rooms (prize includes chair covers and table centres for 50 guests). Enchanted events and Sashes Venue Styling are now under one roof at The Wedding Event Rooms. Visit our showroom today at Carberry Place, Kirkcaldy and view our room displays to get a true experience of how your room can look on your big day. Creating the perfect atmosphere for your wedding or event from Chair covers and table centre pieces to mood lighting, backdrops, LED Dance floor, illuminated MR & MRS signs. One to one consultations to help bring a bespoke theme to life – vintage, elegant, glitz and sparkle we do it all and so much more. Choose from over 100 sash colours to go with your chair colours and we do linen hire too to match in your table cloths.